The first pattern was released July 15th and is Fins. It’s got a lace motif, is knit toe up, and has an interesting method of dealing with the heel – you actually close off the foot completely (but for a bit of waste yarn that gets pulled out later to allow for a leg opening). The leg ends with a garter stitch ‘fin’ bind off. I got a late start on these because I was still finishing up a test knit, and so lost most of the prime weekend knitting time. But I did get them done well before the deadline (we’ve got 9 days for each pattern) and I ended up as the 230th person to finish. Considering there’s over a 1000 people registered this year, I’m pleased with that (and I’m not even remotely attempting to win this challenge). I am….ambivalent about this pattern. It was easy enough to knit, once I figured out what was going on with the leg opening (a *lot* of other people were asking exactly the same question I was, so at least it wasn’t me, it was the wording in the pattern), but I really do *not* like the fins at the top. Part of the challenge is that you have to follow the pattern as written, though, so I grimly knit the fins, but did not cut the yarn at the end . 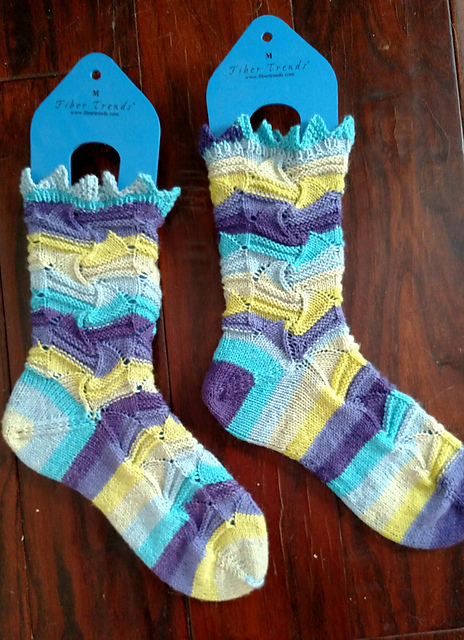 Once Tour de Sock is over for the year, I’ll rip out the fins and replace them with ribbing. This plan was the general consensus for most of the rest of my team too – none of us were fans of the points. The other issue I have with this pattern is that it basically makes use of the afterthought heel (even though it’s not technically done after the rest of the sock is complete, it’s still the same principle) – you can tell this because of how there’s that line of decreases on the side of the heel, that looks just like how decreases are done on sock toes. It’s a nice idea in theory, except for the fact that the ankle is actually the thickest part of the foot, and the (admittedly few) patterns I’ve tried with afterthought heels don’t ever seem to take that into account, and so they always end up feeling a little tight around the top of the ankle. In the case of this particular pattern, the fact that the motif was lace helped save it, since that gives the sock a bit more stretch, to accommodate the ankle, but it still just fits a little…well…weird. Anyway. Despite all this I decided I ought to at least give the whole concept one more go. 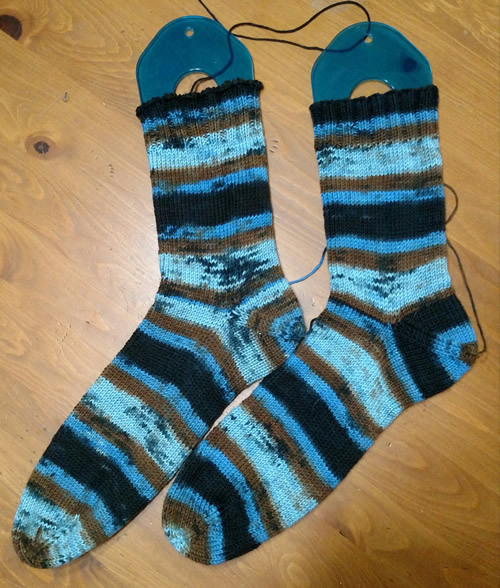 I recently did the Coast Starlight train trip with my sisters (for our 14th annual Sisters Only weekend) and brought along some yarn to make socks for Richard. The first pair was a plain set following my usual formula (Sock pair #1 of my Summer of Socks), but since I wasn’t really feeling the desire to do another pair in the same vanilla pattern, I decided to give the whole afterthought heel/leg idea another try on a pair of socks for Richard. I finished that pair last night. I did try to add some extra stitches around the leg to account for the tightness issue. But…verdict – no. Just…no. They didn’t work over Richard’s ankles either. Clearly neither of us has feet that were meant for this method of turning the heel. Perhaps if I really liked the look and feel of the heel I might be inspired to give it yet another try, with yet more adjustments. But since I already wasn’t a fan, it’s no big loss. There’s plenty of other heel concepts out there, besides my old standby, the slipped stitch heel flap, so unless any of the upcoming Tour de Sock patterns require it, I think I’ll just happily sub out a different type of heel if I run into this one again, and call it done.